That's how the masters do it. "Ah... AH... AHH!!! ....... phew...."
Very common in western animation, when one character is starting to sneeze and current situation calls for being quiet, this character or someone else will use a finger under nose to stop the sneeze from happening. This is typically followed up with a GIANT sneeze about three seconds after the finger is removed. This trope is Truth in Television. There's a pressure point under your nose that, if you press it, temporarily stops the sneeze reflex. Note that you need to press it; simply holding your finger under your nose will have no effect (much like many examples on this page). A similar and equally effective strategy is to press the sides of the nostrils together to relieve the itching sensation; a more clandestine method is to tickle the roof of your mouth with the tip of your tongue. Compare Inconvenient Itch and Potty Emergency. Attempts to avert Pepper Sneeze or Sneeze of Doom with this trope happen sometimes. The dwarfs do this to Sneezy in Snow White and the Seven Dwarfs. When Dopey stands on Sneezy's shoulders for the dance with Snow White, Sneezy begins to sneeze right before they go out, and Dopey uses his foot to stop his sneeze, and it works. 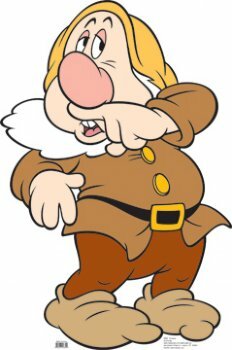 When Sneezy begins the sneeze interrupting the dance, Dopey tries the Anti-Sneeze Finger on himself. It doesn't work. In Balto, Nikki does this to Star to prevent triggering a cave-in (his previous sneeze having caused an avalanche). Unlike most other examples, it actually stops the sneeze permanently instead of resulting in a giant sneeze when the finger is removed. Not that it matters much since the cave-in is soon afterward triggered by another sound. The Three Stooges did it several times. Happens in The Adventures of Sharkboy and Lavagirl when Sharkboy, Lavagirl, and Max are crossing an ice bridge. Lavagirl has to sleepwalk in order to cool down enough to cross, but she nearly sneezes mid-dream, and Sharkboy takes preventative measures. They don't work. Cool World: When Nails the Spider starts sneezing due to his cloud allergy, Frank sticks his finger under Nails' nose to stop him sneezing them off the building. Eventually the sneeze backfires and propels them in through a window. An Even Stevens episode uses this at the end, when Ren is getting a retake of her school photo. She is about to sneeze, but Louis puts his finger under her nose to stop it and save her from being photographed mid-sneeze. An episode of Full House has Danny about to sneeze and Jesse and Joey trying to prevent him from doing so this way. He still sneezes. Joey: It always works in cartoons. The first episode of Mr. Bean has a scene like this, with Bean almost sneezing during a church sermon, briefly holding it back, but then loudly sneezing after all, albeit without the actual finger. In the Poirot episode The Third Floor Flat, after Hercule Poirot gets to his neighbor's room, he feels a sneeze coming on. He takes a deep breath while pointing the finger to his nose... then nothing happens, and he feels relieved... temporarily. A few seconds after he walks offscreen, we hear his high-pitched "ATCHOOO!!!" as a Funny Moment. Doctor Who: The 7th Doctor does this to himself to prevent a Sneeze of Doom when he and Ace are hiding from a Dalek in "Remembrance of the Daleks". On the Barney & Friends special Barney's Night Before Christmas BJ attempts to stop Baby Bop from sneezing after she tickles her nose with Santa's feather pen. Obviously she still sneezes and wakes a sleeping Santa. In one Garfield strip, Jon does this to Garfield. Garfield thanks him, then notices that Jon's leaving the room. Jon says he's going to go "boil my finger". In this U.S. Acres comic, Roy does this to Orson, resulting in himself finishing the sneeze Orson started. In the Lamb Chop's Play-Along episode "Too Sick To Go To The Circus", Shari does this twice to Lamb Chop. Both times it works for just a second, but then Lamb Chop sneezes in Shari's face. In the Looney Tunes short "Frigid Hare", Bugs Bunny stifles an Eskimo's sneeze this way to keep the ice ledge under them from breaking. And then Bugs sneezes. Likewise Yosemite Sam and a chronically sneezing dragon in Knighty Knight Bugs; he attempts to stifle the dragon this way when they end up in a room full of dynamite. Jonny Quest episode "Monster in the Monastery": Jonny does it to himself so he doesn't sneeze and alert the "yeti". He doesn't sneeze afterward, but Bandit does. Alan does this for Anne in the The Amazing Chan and the Chan Clan episode "The Greek Caper" when they, Tom and Suzie are being chased by a masked stranger in a museum and disguise themselves as statues. It works... for about half a second. A Running Gag in The World of David the Gnome. Penelope does it to herself in The Perils of Penelope Pitstop episode "Tall Timber Treachery". The gang do this to Scooby-Doo in almost every incarnation. In an episode of My Little Pony, Megan does this to prevent Gusty from sneezing. Even though it worked the first time, she still wound up sneezing a couple times anyway because Megan wasn't there to stop it. Hilarity Ensues. One episode of Dastardly and Muttley in Their Flying Machines featured the Anti-Sneeze missile, which would hit anyone who sneezes. A misfired pepper shot forced the Vulture Squadron members to use the Anti-Sneeze Finger technique to avoid being targeted. It ended as well as expected in that cartoon. Muttley was the one who sneezed. He was at the end of the line so nobody could cover his nose. Invoked by Vanity Smurf on Smurfette to keep her from sneezing when the feather in his cap tickles her nose in The Smurfs episode "The Adventures Of Robin Smurf". Super Friends 1973/74 episode "The Baffles Puzzle". When Marvin and Wonder Dog are in a library, Wonder Dog starts to sneeze. Marvin holds a finger to his lip and stifles it, but a few seconds later he sneezes anyway. In the My Little Pony: Friendship Is Magic episode "Owl's Well That Ends Well," Spike does this to himself when the dust from the library book Twilight sent him to get starts bothering him. It doesn't work, and his fiery sneeze destroys the book. In an episode of Dragon Tales Ord stops himself from sneezing as they fly through the Dandelion Forest by putting clothespins on his nose. It works, until Max takes off the plugs because they need a powerful Sneeze of Doom to save them from the vicious roaring dandelions. PJ Masks: In the episode Gekko's Stay-at-Home Sneezes, Amaya does this to Greg at the start of the story. It works. In American Sign Language, the sign for "sneeze" is putting your finger under you nose, like so, and pretending to sneeze.